Servato’s proprietary technology and Adaptive Charging methodology can double battery life in 12V VRLAs. Laboratory and field testing is outlined below, and Servato has presented these advances at industry conferences over the last several years. Subject matter experts agree that Servato’s methodology has stood out among battery technologies. 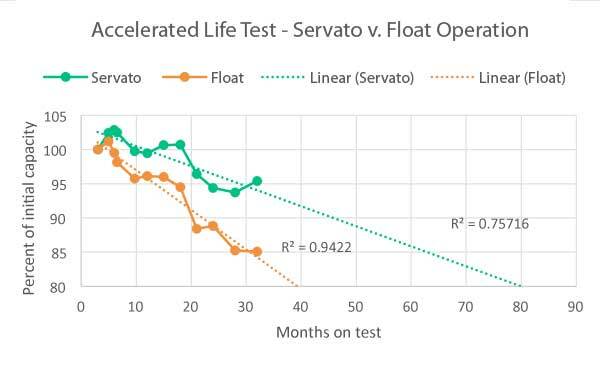 In June 2014, JBI Corporation, a respected independent battery testing laboratory, completed a 3 year study comparing Servato’s proprietary solution for battery life extension against industry standard float charging. As the Figure 1 to the right shows, the resulting data imply at least a doubling of battery life for Servato-managed batteries relative to traditionally float-charged batteries. This lab test was conducted at constant temperature and environmental conditions. In the field where temperature fluctuates, power outages discharge batteries unpredictably, and other variables impact battery life, Servato has found better life extension results. Figure 1: After 32 months, the trendline predicts batteries on float will fail twice as fast as those Adaptively Charged. Figure 2: Float Charging vs Adaptive Charge Management (ACM) and the impact on battery capacity after 16 months. 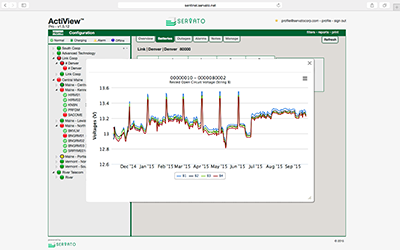 Servato has also completed 18 month field trials with CenturyLink in Denver and Phoenix. At the conclusion of the trials the data confirmed Servato’s ability to extend battery life. In Denver, a 2-year old control string that was float charged for 18-months and a 6-1/2 year old string that was Servato controlled for the same period were measured to have the same average capacity, even though the Servato string should have been considerably lower due to its age. In the Phoenix study, testing both a Servato controlled string and a float-charged string with a standard Midtronics tester after 16 months revealed that the Servato controlled string had 10% higher capacity. This is considerably better than what was measured in the JBI lab trial. Servato has several ongoing field trials with customers at a variety of telecommunications sites from small cabinets/RTs, Huts and offices of various sizes, and Wireless sites. The early data from these trials in in line with all the other life extension data we have accumulated. So far, this and other battery data amounts to more than 31 million hours of battery operating data. As this data is processed and analyzed, Servato continues to refine the charging algorithms that enable us to extend battery life of VRLAs. Figure 3: Battery data gathered in ActiView. Ready to Learn More about Servato?